Last night I was so tired I fell asleep sitting up, still clutching two feet of virgin dental floss. It’s not as bad as the time I fell asleep in that hotel dining room and split my jaw open on the edge of the table but it gives you the idea. I never did get to the flossing part of my oral hygiene regimen – AND I dreamed terrible dreams all night. First, in the hours from midnight to 4am, the dream was about my being stalked by a murderous thug who wanted to kill me. I would wake and return to sleep and the dream would continue – until I finally killed him by heaving a chair above my head and, with my Supergirl powers, planting one leg of it, hard, into his left eye and on down through to the floor. You’d think it would at least be a garroting what with the two feet of dental floss and all. Then the dream from 4am to 6am was about a real friend in my real life who died at 35, but in the dream he didn’t know he had died and was still among us these many years later, aged appropriately and sitting at the table. “You’re not as jocular as you once were,” I said to him, and he smiled sadly. I thought all the way through the dream that I knew more than he did. He was dead after all, a figment of my imagination. Unless really it was his dream in which I was the figment. I realized something just before bed last night that brought me down into this pit of gloom and permeated both my sleeping and waking lives both, but I’ll save THAT cheery account for tomorrow. 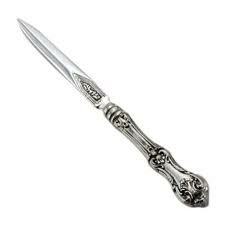 I guess we should all be grateful I didn’t come to bed clutching our letter opener. Anyway, I missed you and all those leaving replies. Thank GOD! I was about to send out a search party!